It has been a long time since I have used soap or bathing bar. I used to be a huge fan of Yardley London soaps (especially the lavender fragrance!) but I usually get bored of using the same bathing products. Body washes keep good care of my body skin and currently I am in love with Asos body washes (Read review here!). 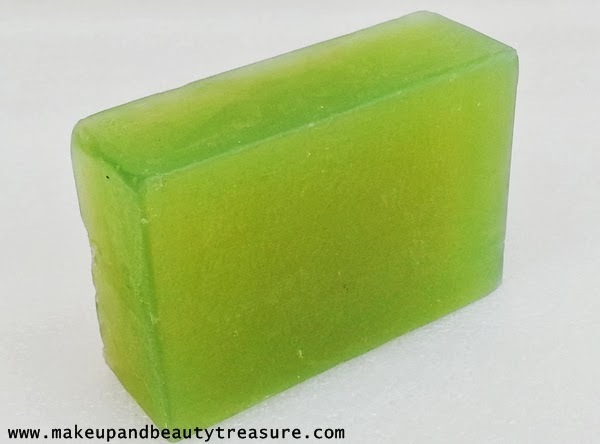 Today I am going to discuss my experience with Lass Naturals Aloe Vera Handmade Bathing Bar. Available at: Online shopping sites. Lass Naturals Aloe Vera Handmade Bathing Bar comes sealed in a clear plastic wrapper with the entire information on the back. It is yellow-ish green in color and is rectangular in shape. As soon as the wrapper is removed, the wonderful aroma of tea tree oil becomes obvious. The scent is neither very strong nor very dull and instantly wakes you up. The soap creates a soft, rich lather that feels extremely soft on my skin. The scent does not tend to intensify and feels really soothing and calming. It vanishes away as soon as the soap is rinsed out (As I don’t like fragranced product, it actually do not bother me!). The soap removes all dirt and grime off my skin without stripping off moisture. It is easily rinsed away without leaving a greasy or sticky residue behind. My skin feels soft, silky, smooth and thoroughly cleansed. The soap moisturizes my skin due to the presence of various oils such as coconut oil, castor oil , olive oil, lemon oil, tea tree oil etc. 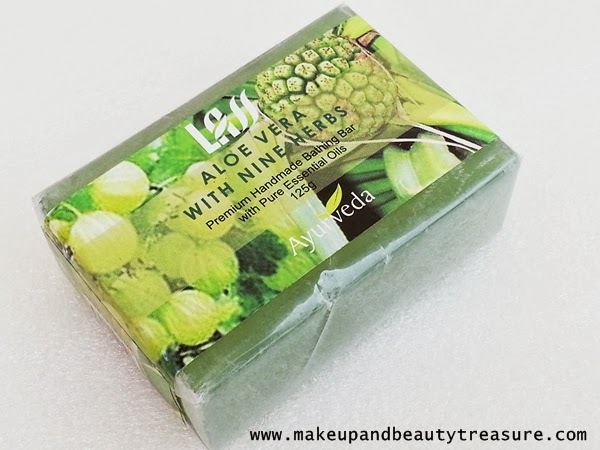 It contains aloe vera that is known for soothing the skin. It does not dry out the skin unlike other soaps. It does not get soggy or melt in my soap dish that I really like. • Nice and soothing smell. • Creates soft, rich lather. • Removes all dirt and grime off the skin. • Makes skin soft, smooth and squeaky clean. • Made with 100% pure vegetable oils. • Loved the color of the soap. 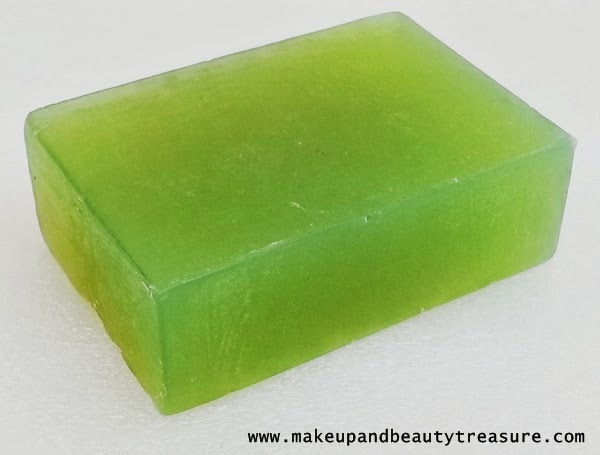 Lass Naturals Aloe Vera Handmade Bathing Bar is a great soap that makes skin soft, smooth, hydrated and squeaky clean without stripping off moisture. The smell is neither very mild nor very strong. It is soothing and refreshing. The soap contains all good ingredients that make my skin healthy and clean. It does not melt and lasts for a month. I would happily recommend it to everyone. Thanx Preeti :) U ll love it! Yardley Lavendar Soap Is a Total Bliss For Me! Yup it does not dry out the skin. love soaps that dont dry out the skin!! this soap looks so beautiful and it's great that it's made from natural ingredients! ohhh wow. This sounds great. and is affordable too. I have a crush on handmade soaps..
OMgsh I'm going to try this soap .... Love such herbal/ natural products .